July 4th – 11 a.m. to 9 p.m. at Lake Murray Community Park, 7001 Murray Park Drive, San Diego. Come enjoy a full day of live music followed by a fireworks display set to a custom soundtrack. Admission is free, and a variety of food vendors will offer hotdogs and hamburgers, BBQ corn and kettle corn, Italian ice and more. Event will have food, games, prizes, kiddie train rides and more! Live musical entertainment begins at 3:00 PM with a spectacular fireworks show at 9:00 PM. Arrive early for parking to find the best spot for your picnic and to view the fireworks! For more than twenty years, Julian residents, their friends and parade lovers from all over have lined up at on the town’s main street to wave their flags, cheer the marching bands, salute the Marine Color Guard, and carry a giant American Flag down the thoroughfare. Antique cars, vintage tractors, belly dancers, World War 2 Submariners, and several comedy entries will appear to complete a fun well rounded home town parade. There will be no fireworks! Alpine’s old fashioned parade will feature a wide variety of patriotic entries from antique cars and motorcycles to decorated children and everything in between. The parade will terminate at the Alpine Community Center Park, home of the Alpine Veterans Wall of Honor, where we will enjoy Food, Vendors, Dunk Tank, Live Music, Entertainment, Bounce House and Fun & Games for the WHOLE FAMILY! There will be no fireworks! SeaWorld will celebrate Independence Day with a 15-minute display of fireworks set to a musical soundtrack, starting at 9:40 PM. 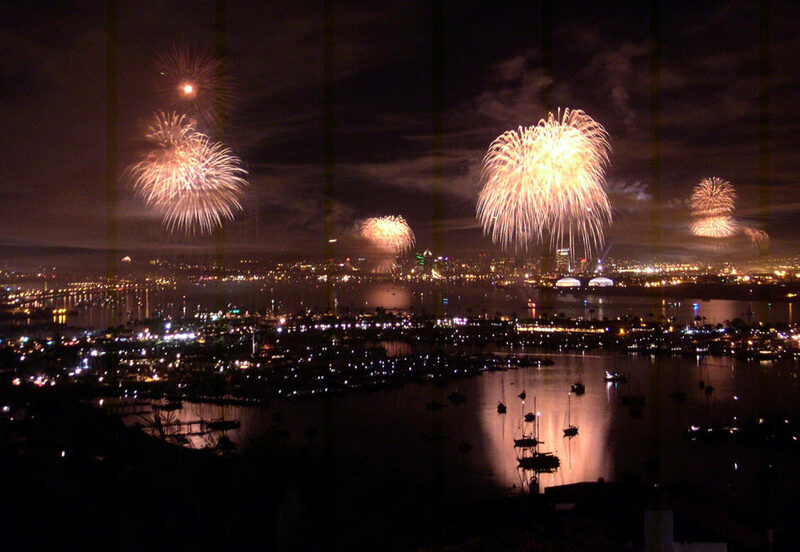 July 4th – 9:00 PM at Ocean Beach Pier at the end of Newport Ave. Parade, crafts and activities of early San Diego recreate an old-fashioned Independence Day celebrated on the frontier. You can also compete in contests, such as cherry pit spitting or the egg toss, for handmade ribbons. There will be No Fireworks! Fireworks start at 8:30 PM. Take the whole family and spend the day enjoying over 60 rides, shows and attractions along with some all-American picnic games like burlap races and water-balloon tosses and then top it off with an awe-inspiring fireworks display set to patriotic music. Pack a few blankets and chairs for Rancho Santa Fe’s Annual 4th of July Parade & Picnic with live music, food, fun and more. There will be No Fireworks!